On Friday November 10, the Operations and Information Management (OPIM) department held a workshop on Blockchain. 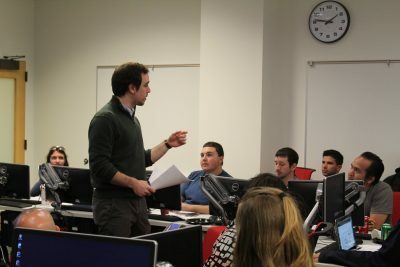 In his third workshop of the semester, adjunct professor Stephen Fitzgerald, a UConn alumnus and Management Information Systems (MIS) graduate, was faced with the difficult task of explaining the intricacies of Blockchain in a ninety minute time frame. Blockchain is a peer to peer distributed database that records transactions. “Everyone can have a copy of the ledger, the list of all records, and see every transaction. Because everyone has this ability, everyone can check and make sure that the lists are correct,” said Fitzgerald. Each group of transactions gets added to the ledger as a different block, and it becomes a chain because each block builds upon the data from the first block. Although the concept of Blockchain is relatively new, it is not a new technology. Instead, it is a system that uses existing technologies, that wouldn’t normally be combined, in new ways. “It’s sort of a greater than the sum of its parts product” using elements of cryptography, accounting, and math to create the database. Blockchain can be used for a variety of different things such as to track produce, ensure flawless audit trails, assist lawyers with contracts, and utilize cryptocurrency. In an example given by Professor Fitzgerald, Blockchain can track produce, diamonds, and other goods back to their source. This is because Blockchain provides a seamless trail from the first stage of production until its final destination. The blocks in a block chain are interconnected and because the chain of transaction trails is open to the public, the tracking of produce will forever lead in the right direction, and the same goes for audit trails. Perhaps one of the most common users of Blockchain is a cryptocurrency called Bitcoin. Cryptocurrency is a digital currency that can eliminate the necessity of a bank. Turner Carnes, an MIS student who attended the workshop emphasized the importance of blockchain in Bitcoin saying, “it has the potential to grow and be used in a lot of big businesses for more security with transactions.” Because all of the transactions will be made public and everything is built upon the previous transaction, there is a permanent trail for big business to track their money. Although this is a great idea, Bitcoin was running into issues because of the anonymity in the app. Because no names or identification were used, it was difficult for users to establish trust in the people they were sending their Bitcoins to. This is when Ethereum developed smart contracts. Smart contracts are contracts developed by users in order to legally bind people to their word. Once this contract is created, it is coded into the Blockchain and becomes a permanent part of the block. In the future, these contracts can be applied to real estate and law. Although this was a denser topic than some of the previous workshops, Professor Fitzgerald did a great job translating the complicated Blockchain system into terms that the audience could understand. Michael Greco a freshman MIS major said, “it wasn’t like a class. The instructor was very engaging so it was really fun. I’d love to go to more workshops in the future.” The OPIM Innovate workshops are a great way to expose students to advanced technology and give them the opportunity to learn in a fun, interactive environment. The next workshop on Microcontroller Applications will be held Friday, December 1st at 1PM in the OPIM Gladstein Lab on the third floor of the School of Business. This entry was posted in News, OPIM Innovate.